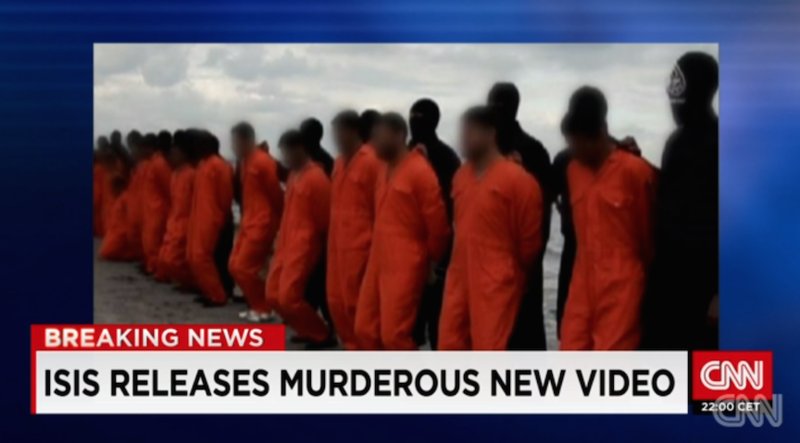 ISIS Video Shows Beheadings Of 21 Egyptian Coptic Christians. CNN – In a new video released by ISIS on Sunday, the militant group claims to have beheaded 21 Egyptian Coptic Christians on a Libyan beach. The video shows an apparent mass execution with jihadists in black standing behind each of the victims, who were dressed in orange jumpsuits with their hands tied behind their backs. Then on cue, all the victims were pushed to the ground and beheaded. Egyptians President Abdel Fattah el-Sisi confirmed in a statement that Egyptian martyrs had fallen victim to terrorism and expressed his condolences to the Egyptian people. El-Sisi Said Egypt reserves the right to retaliate for the killings, according to the state run website Ahram Online.